We've turned the classic tiramisu dessert into these Caramel-Macchiato Tiramisu Parfaits. Made with butterscotch pudding in dainty little parfait cups, these single-serve tiramisu desserts are delectably delicious. Beat cream cheese in large bowl with mixer until creamy. Gradually beat in milk. Add dry pudding mix; beat 1 min. Gently stir in 1 cup Cool Whip. 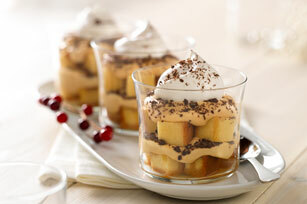 Instead of serving the dessert in parfait glasses, serve in a clear glass 2-L dessert bowl. Place half the cake cubes on the bottom; continue preparing recipe as directed.